Tomorrow morning Esther and I are running this season’s first race, a 5K in Prospect Park. Despite running over 200 races between us, this one was different. It’s not about goal times or PRs this one is for a cause, to honor my late mother-in-law’s memory. Two years ago, Maria Hernandez, or Lola, as she was known to her friends lost her battle with Pancreatic Cancer causing a loss that hasn’t been replaced. This ugly disease with an extremely low survival rate took Robert, Lucas and Justin’s grandmother and Cristian will never know her because of it. 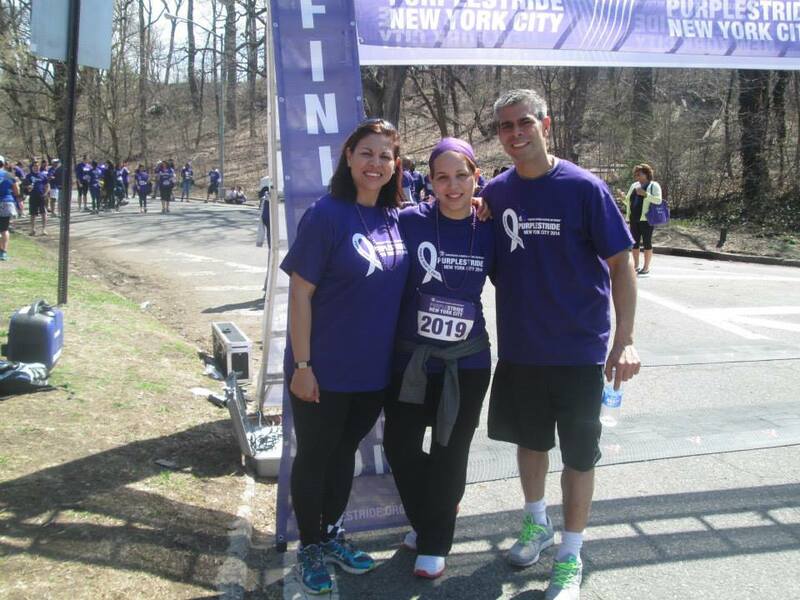 Last year running became a family event as Lola’s children Esther, Bobby and Rose Marie, joined by friends and teammates signed up for the PanCan Purple Stride 5K Run/Walk to honor her memory. I paced Bobby while Rose Marie and a pregnant Esther walked the 5K. We had a great time on a beautiful Saturday morning raising money for a good cause. We’re back in Prospect Park tomorrow morning with a bigger group of friends and family to keep Lola’s memory alive once more. Last year we got off to a slow start but Rose Marie, our Team Captain, took charge printing up T-Shirts and heading up the fundraising effort. Although Esther is a little nervous running her first race in 16 months, she’ll be fine. Mami will be looking down with a smile on her face. If you know anyone suffering or lost someone to Pancreatic Cancer or are interested in donating to a good cause click here. Thanks in advance.